Today’s guest post is from travel blogger Billie Frank, who gives us a reminder and perspective on tipping at a luxury resort like our Keystone property. Many travel bloggers who’ll be at TBEX 12 in Keystone, Colorado, are budget travelers. If you’re not familiar with luxury resorts, or tipping in the United States in general, at TBEX you may wonder, “How much should I tip?” Others have been to high-end hotels on press or blogger trips where the hotel, PR firm, CVB or tourism board takes care of the staff for you. But at a convention, tipping is up to you. Understanding tipping can take the anxiety out of the process so that you can enjoy your stay without fretting about what to give the housekeeper, the valet or the bellman. 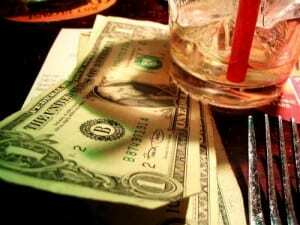 Restaurants: As with restaurants anywhere in the US, 18 to 20% is the norm for a tip, more if you have incredible service and less if the service is not up to par. Since your TBEX 12 registration includes meals, you don’t have to worry about tipping unless you have additional, non-included meals. The valet: There is plenty of free onsite parking, but if you opt to use valet parking there is a fee. In that case, the first person you are apt to meet when checking in the valet. These folks really hustle and earn that tip. Now, here’s the tricky part; do you tip on both in and out? A common valet tip is $2, given when the car is delivered. The valet that takes your car is often not the same one returning it and so some people tip at both ends with the larger tip when the vehicle is brought to them. There is usually more hustle on the return end as the valet knows you want your car quickly. The bell-person: If you use luggage assistance, give at least $2 per bag; $5 to $10 is reasonable for good service. Tip more for extremely heavy or unwieldy bags or if there are a lot of odds and ends on the luggage cart. A good bell-person will set your luggage on caddies in your room and hang appropriate garment bags and loose garments. Before leaving s/he will make sure you understand the intricacies of your room, including heating or air conditioning, audio-visual, telephone and Wi-Fi systems. The housekeeper: One of the hardest, most thankless jobs in a hotel is the housekeeper – people sometimes leave rooms in appalling condition. During your stay, the housekeeper is not expected (or in many cases not even permitted) to move your possessions, so leave the room in a cleanable condition. A suggested minimum tip is $3 per day; $5 is generous. If your room is really messy and requires a lot of work or really trashed when you check out, leave a larger gratuity. It’s a good idea to leave housekeeping tips daily in an envelope marked “Housekeeper.” If you wait and tip at the end of your stay, it might be a windfall for a fill-in housekeeper who has done your room once in a multiple-day stay. During your stay, the envelope is important. In many hotels, if housekeepers touch money left in the room, they can be fired. If you need something extra brought to the room, pillows, towels, etc., a dollar or two is appropriate. If a member of the housekeeping staff does something above and beyond, tip accordingly. I know that many travel bloggers are on a tight budget, but at the very least, tip these hardworking folks, especially if you’ve been very hard on the room. .
Room service: Room service can be tricky. The hotel usually adds a service charge to the bill, although this is not a tip. Sometimes a gratuity is also added. It’s a good idea to ask at the time you place your order. If the tip is not included, the amount should be the standard 18% and 20% of the food and/or drink bill before taxes. If the server sets your food up and goes above and beyond, you may want to tip them a bit extra. Shuttles: If you’re taking a shuttle from the airport, it’s a nice gesture to tip the driver, especially if they are stowing your luggage. A suggested tip is $2 to $5 per person. Enjoy your time at TBEX12. And remember, don’t forget to tip those who serve you. Santa Fe based freelance writer and former concierge Billie Frank writes extensively about Santa Fe and Northern New Mexico for her blog Santa Fe Travelers. A former print journalist, she is a contributor to other online publications focusing on food and travel and is a Contributing Editor at Travel Squire. Billie was a consultant and contributor for DK Eyewitness Travel’s 2012 revision of the Top 10 Santa Fe, Taos and Albuquerque guide. She is co-owner of a trip planning and tour business The Santa Fe Traveler, designing unique experiences for visitors to Santa Fe. You can find Billie on Facebook and on Twitter. Loved this friendly reminder. TBEX here we come. Thanks for sharing my tipping post. It’s amazing how many guests asked me about how much to tip when I worked at a hotel. Hope this is helpful to people. Very helpful! I’ve never been sure what the standard practice was for tipping housekeepers. Thanks for this. This is the best explanation of how, when, and how much to tip the housekeeping staff that I’ve ever read. I’ve worked in hotel housekeeping and I couldn’t have said it better. This is one of my pet peeves. If I stiff someone its because their service was truly horrible. When you get exceptional service please show your gratitude with cash but also tell that person what a great job they did. They definitely need the money to pay the bills but a big thank you and “wow that was the best cab ride I have had in a long time. Drive safe” can make someones day. by the way it makes you feel better too.